Last year over 4000 people cycled from all over Scotland to loby the parliament for a cycle friendly Scotland. Whilst there has been some improvement, there is much more that can be done. Go Bike encourages all its members and supporters to travel to Edinburgh for this Pedal on Parliament event. Saturday 26 April 2014 – Pedal on Parliament. Meet 11.30am for 12 noon start, The Meadows, Edinburgh. Glasgow Feeder Ride: Meet 7.15am for 7.30am prompt start, George Square (north side), Glasgow. 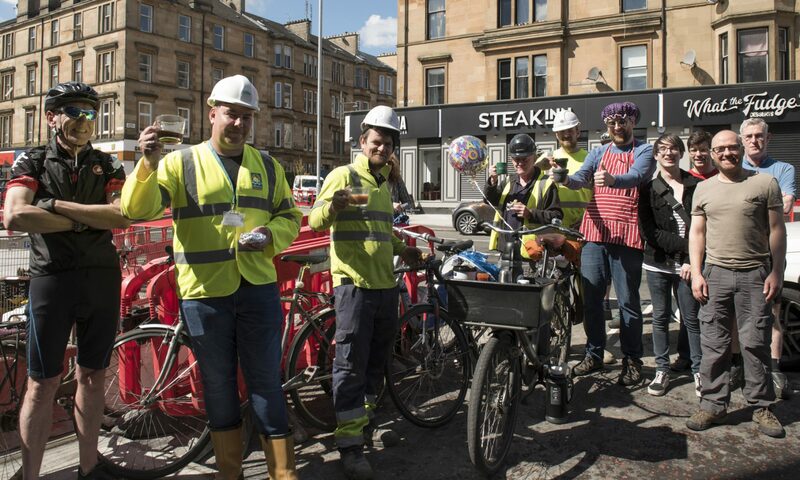 Glasgow Road Cycling Meetup (GRCM) are joining us for a 7.30 departure from George Sq. So far they have 15 riders signed up for this event, so we’ll form a large group. Last year we took around 4 hours to get to the Meadows from George Sq, going via the A89 & A8, with a coffee stop in Bathgate. Average speed 12.5mph. Last year most of the GRCM riders cycled back to Glasgow. The A89/A8 route provides the option to get a train at many points along the way. For those who prefer a later start, shorter ride or slower pace Belles on Bikes are getting a train to Linlithgow and cycling from there into Edinburgh.